Authors:Leen & Kathleen Ritmeyer, paper back, 72 large format pages. Published by Carta, Jerusalem in 2005. Nehemiah was the great reformer who rallied the people to repair the walls of Jerusalem that were broken down in the Babylonian destruction of 586 B.C. 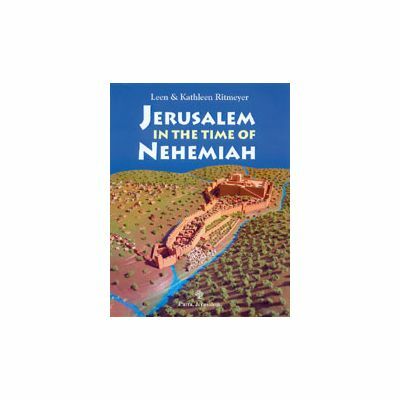 In this guide, the reader is first immersed in the historical background to the time of Nehemiah. Then in an imaginative reconstruction one of the builders of the wall (a Tekoite) describes for us some of the moving events of those stirring times. 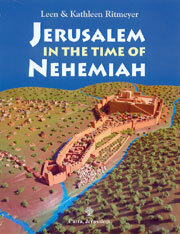 The primary focus of this book, however, is a detailed archaeological tour of Nehemiah's Jerusalem. Profusely illustrated with photographs of a recently constructed model, the book also contains rare photographs of archaeological remains extant from the period. This is a must read book for all those planning to visit Jerusalem along with the Ritmeyers companion book Jerusalem in the year 30 A.D.